Whether you’re training for a marathon, sprinting to a lover or running from the cops (hopefully not! ), this hodge-podge running playlist with songs about running will get you moving. And with a total run time (run time … get it?) 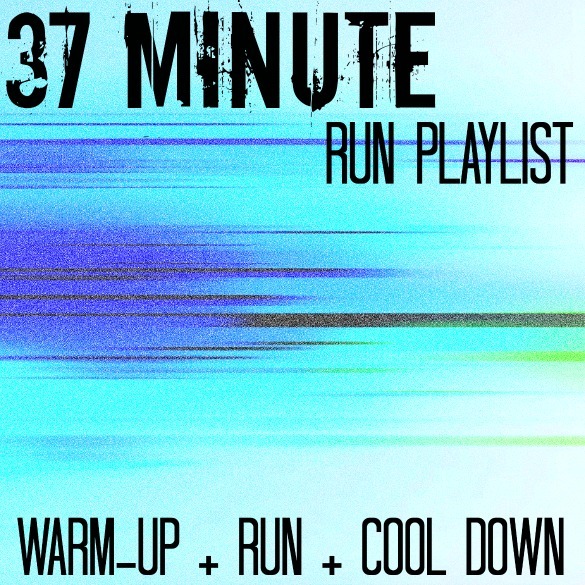 of just about 37 minutes, it’s the perfect length for a running workout! (4:00) Running, No Doubt: Our love for Gwen continues. Warm up with a slow walk, picking up the pace during the choruses. (3:51) Ready to Run, Dixie Chicks: When the Dixie Chicks are ready, ready, ready, ready to run, you should run faster, too. (3:39) Let’s Get It Started, Black Eyed Peas: Let the chorus be your guide. Get a sprint started when the Peas want to “get it started in here” and recover between the choruses. (3:50) Play, David Banner: Be warned, the explicit version is explicit. Steady song for maintaining your pace. (3:25) Break My Stride, Blue Lagoon: This version’s a little more fast-paced than the original, so feel free to pick up the pace again. (4:22) Runnin’ Down a Dream, Tom Petty and the Heartbreakers: Recover from your last push for the first half of this song, then pick up the pace again. It just wouldn’t be a running playlist without this one! (2:15) Run For Your Life, The Beatles: Pick up the momentum here for a minute, then recover before your last push. (3:17) Police On My Back, The Clash: Pick up the pace for the last time here, pushing yourself when they start listing all the days of the week they run. (4:35) Run, Collective Soul: Slow it down, ending on with a walk. Pat yourself on the back for a run well done! Ha! Good play list. I love the BEP for my runs. Believe it or not, I like Britney Spears too. Ugh, I know but her music has a great beat to it. That song “Gimme More” is great for that extra push. Cool! Thanks for the ideas. So glad Chariots of Fire or teh Rocky theme don’t appear on this list. I love Born To Run! I rock out to that all the time in my training. Love that playlist! Sure gets you in the mood for exercising. Also involving the word “run” in a motivating manner: Black Eyed Peas: Let’s Get It Started. Pump it by black eyed peas. It that when you are close to tired. It pushes your pace. Also so we run David Usher. I like this right aftery warm up. It sets the tone. Madonna feel it in my heartbeat. You have to add that one for sure! Lastly, another one bites the dust by Queen. Think of that song when your racing for real or training to race. Happy running! I always get pumped up when Love Runs Out by OneRepublic comes on! Great beat!! I love Collective Soul and their song Run. I can’t believe I hadn’t thought of adding that to my playlist as a cool down song. Thank you for the inspiration!